Containing advice on making DOS programs Year 2000 compliant, this manual highlights the popular applications of working with DOS. This edition covers version 6.22. Windows may rule the world of popular computing on PCs around the globe, but DOS still has a place in the hearts and minds of computer users who vaguely remember what a C prompt looks like. 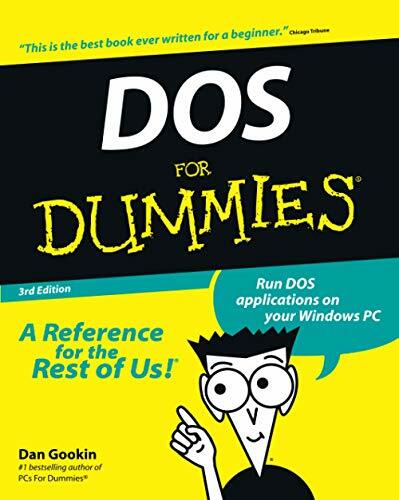 Even if DOS (with all its arcane commands and its drab, boring look) isn't your idea of the best way to get things done on a PC, you'll find plenty of fast and friendly help on hand with the third edition of DOS For Dummies. Here's a plain-speaking reference guide to all the command-line stuff and nonsense that makes DOS work, whether you're a native DOS user or are an occasional dabbler who needs the operating system to run all those cool games under Windows. DOS For Dummies, 3rd Edition, avoids all the technical jargon to cut to the heart of things with clear, easy-to-understand explanations and step-by-step help for Changing disks and drives Dealing with the DOS prompt Managing files Running DOS inside Windows Installing and running DOS-based software programs Working with the printer and serial ports Using the mouse and keyboard Troubleshooting problems Understanding DOS error messages All the basic DOS commands, from APPEND to XCOPY, are demystified to make life in DOS much more bearable. This handy guide has plenty of helpful tips and tricks for bending DOS to your will, without having to dedicate your life (and all your free time) to mastering this little corner of the PC. Author Dan Gookin's first edition of DOS For Dummies became an international best-seller. He considers himself a computer "guru" whose job it is to remind everyone that computers are not to be taken too seriously. His approach to computers is light and humorous, yet very informative. Gookin mixes his knowledge of computers with a unique, dry sense of humor that keeps you informed ? and awake.